Lots of people are looking for healthy substitutes for coffee creamers. Fortunately, there is lots of choice. But before we take a closer look at any products, I want to look at coffee creamers in more detail. Coffee creamer is a non dairy liquid or powder that is added to coffee to give it a cream- like texture, color and taste. The most famous coffee creamer, Coffee Mate was launched way back in 1961. The main reason that people use coffee creamer is because it is not dairy. If we are looking for healthy substitutes for coffee creamers, what is unhealthy about coffee creamers? The main concerns around coffee creamers is that they are highly processed foods. Allergic reaction: A recent study has found that a massive fifty million adults in the US are lactose intolerant. Fat Content: Half and half has a fat content of 12% and heavy cream has a fat content of 36%! Low Carb: Strict followers of low carb diets try and minimise the amount of dairy produce that they consume because it contains a sugar (lactose) which is counted as a carbohydrate. Perhaps it might seem a little strange to include butter in an article about healthy substitutes. Butter has had a very rough ride over recent decades, blamed for everything from obesity to heart disease. Butter seems to be one of the only foods that contains vitamin K2, which helps fight against cancer and cardiovascular disease. Butter also contains lots of saturated fat which can help raise our levels of good cholesterol in our bodies. For years, saturated fats were thought to cause cardiovascular disease but it is now thought that this is nonsense! It also contains Conjugated linoleic acid (CLA) which can help with weight loss. Butter has a fat content of 80%, so even if saturated fats are not as bad for us as we first thought, it contains a huge amount of calories. So just consume it in moderation. Butter coffee, paleo coffee or bulletproof coffee was a big trend a few years ago with coffee drinkers. Butter is a natural coffee creamer. Just adding it to black coffee will add a creamy texture to the drink. It will also stop hunger pangs and keep you fuller for longer. So if you like the idea of trying some butter coffee creamer and you want a go at making it at home, look at the recipe below. This recipe uses a special machine to create the butter coffee creamer but you could easily copy this recipe without the machine. You just need a food blender to mix all the liquids together and a grinder to crush the pecan nuts in. If you prefer to buy one instead, I have listed my favorites below. 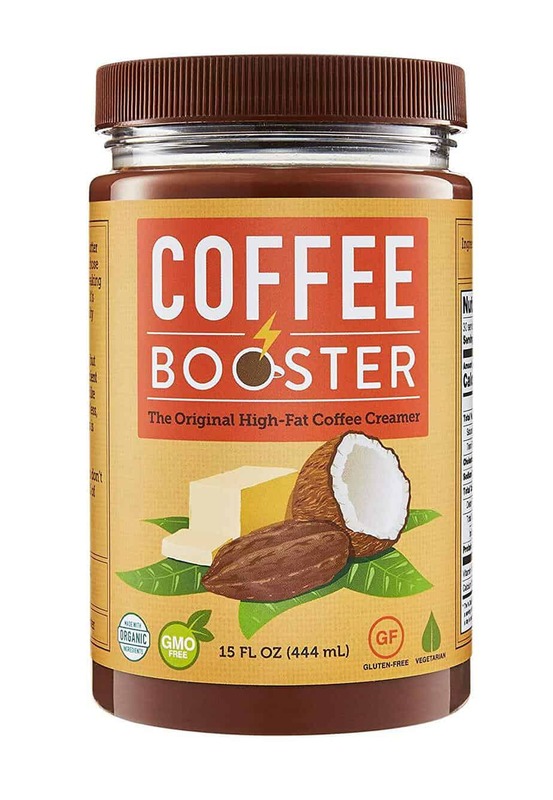 This creamer is for fans of butter coffee and it is targeting people on specific low carb diets such as Keto and Paleo. Or people who take their fitness routines, such as yoga, very seriously. It will also attract people who like more natural products as this creamer is organic and non GMO. The main ingredient is grass fed ghee but it also contains organic coconut oil. And not forgetting MCT (Medium Chain Triglyceride) Oil which is an ingredient with special powers that can improve memory function and boost energy levels. This is another specialist product aimed at people who are on Keto and Paleo diets. Like the Omega Power Creamer, Coffee Booster is an organic and non GMO mix of coconut oil and grass fed ghee. And they both contain 120 calories per serving. But unlike the Omega, Coffee Booster does not contain MCT but it does contain raw cacao powder. Did you know that coconut is a fruit not a nut? In recent years, coconut oil was the next big thing in diets. It was a new super food. It is rich in vitamins C, E, B1, B3, B5 and B6 and minerals including iron, selenium, sodium, calcium, magnesium and phosphorous. But a couple of years on concerns are being raised about just how healthy it really is. It is thought to have the highest levels of saturated fat of any food. Coconut oil contains 82% saturated fat. Butter has 63% and beef has 50%. This simple recipe uses four ingredients to create a delicious coffee creamer; coconut milk, vanilla extract and maple syrup. If you are looking for a tasty coconut creamer to buy, then my favorite two are listed below. If you are looking for a healthy alternative to a coffee creamer, which is still thick and creamy, then nutpods could be for you. This creamer is targeting buyers who want a product made from natural and real ingredients instead of a bunch of chemicals. Made from almonds and coconut cream, this creamer is aimed at buyers who like their nuts. But with a slight twist of a French vanilla flavor. Unsweetened, with 0g of sugar this creamer will appeal to buyers who want to stay away from sugar as part of a healthy lifestyle. The Keto Creamer has been created specifically for a health conscious group of people who are on the Keto diet, which is a low carb diet. Not only does the Keto Creamer contain no sugar but it also contains MCT (medium chain triglycerides) oil. and help your body burn more fat. And not forgetting that it is made from coconut oil. Almonds were first used by the Romans but it is thought that almond milk dates from the 12th century and was created as an alternative to cow’s milk, which was not allowed to be drunk during Lent. The benefits of almond milk are that it is low is calories and fat, very high in calcium and has no sugar. Almond milk is a healthy milk but it is not as nutrient rich as soy milk which has lots more protein in it. contains four ingredients; almonds, water, maple syrup or vanilla extract. The most complicated bit of the recipe is that the almonds need to be soaked in water for up to 48 hours. Dairy free, soy free and gluten free, unlike the creamers listed above, this Califia Farms product just contains almonds and not almonds and coconut. Almond is a subtler flavor than coconut and so this milk is for someone who wants a creaminess without an overpowering flavor. It also has a very low calories count, measuring a mere 10 calories per serving. This is a similar product to the almond milk above, this product appeals to buyers who want an almond only flavor. The biggest difference is that this product comes in single cartons, whereas the almond milk creamer from above is sold in packs of 6. Another difference is that Almond Breeze is 30 calories per serving whereas the almond milk from Califia Farms is only 10 calories per serving. Turmeric has a few very powerful health benefits- a fact that growing numbers of people are becoming aware of. It has anti inflammatory properties and can help pain relief. Its antioxidant properties might improve our liver function and protect your liver from being damaged from toxins. The same anti inflammatory and antioxidant properties of turmeric really help our digestion. This delicious turmeric coffee creamer combines coconut milk with ground turmeric and dried buds of lavender that delivers a real tasty treat. It takes just 5 minutes of preparation and 10 minutes of cooking to make this. Finally, here is a very popular turmeric coffee creamer. This turmeric coffee creamer is really targeted at people who want a turmeric flavored creamer because of the health benefits. I am not sure that there would be anyone who would buy a turmeric creamer for the taste!